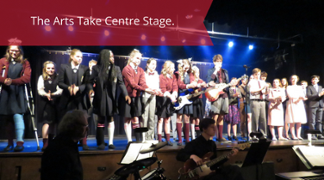 Senior student and "Lifer" of 7 years at KES, Joanna Bond, from Hubbards, Nova Scotia, is no stranger to our Music programme, most especially on stage with our musical theatre productions. Joanna is also a vocalist in the School Jazz Band and Drum Sergeant Major of our Cadet Band. I first directed Joanna even before she was a King's-Edgehill student; she was in Grade 5 and acting in a collaborative production of Jane Eyre between King's-Edgehill School and local theatre company, Quick As A Wink. Since then, I have seen Joanna in every School musical and a bevy of community shows as well. Musical theatre is JoJo's passion. I doubt that there is a musical with which she is not familiar. Like my other Grade 11 and 12 music students, Joanna recently was adjudicated by my associate music teachers here on campus. The comments they made will be useful to her as she prepares for her graduation recital this spring. Joanna performed Think of Mefrom The Phantom of the Opera. This song is regarded by many to be challenging, especially by the final operatic cadenza of scales and intervals that include a high Bb. 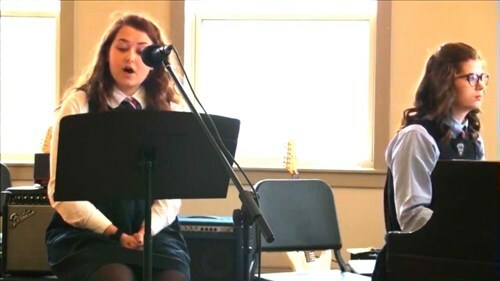 Accompanying Joanna, is another Grade 12 student and accomplished pianist, Elizabeth Walsh from Labrador. I hope you enjoy the performance!